In 1860, Philip A. Emery arrived in Kansas, in the Wakarusa River valley, to start a new life. He had previously lived in Indiana and worked for their state school for the deaf as a teacher. Thrilled that there was an educator who could teach deaf children, Jonathan Kennedy, who had three deaf children, persuaded Emery to start a school for the deaf. When Emery agreed, Kennedy borrowed $200 and went with Emery to find a suitable location for the school. They found a modest two-room house with an attic in Baldwin City. The rooms could be rented for $5 a month. The school officially opened October 1861 but didn't receive its first student until December when Elizabeth Studebaker arrived from Clinton. In March 1862, the state legislature voted to assist the school by appropriating $500 per year to help with operational costs and twenty-five cents a day for each student. In 1864, it was decided that all state institutions should be located in Topeka so for a short period, the school was moved to Topeka but returned to Baldwin City the following year. The decision on the location was still up in the air as there became a bidding between Baldwin, Olathe and Topeka over the location for a new school for the deaf. 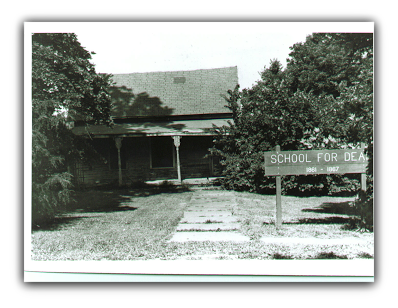 On November 15, 1866, the Kansas State School for the Deaf and its 18 students left Baldwin City for Olathe and into a new stone building. The stone building was torn down in 1886 and replaced with a new administration and dormitory building and by 1893, enrollment at the school was over 200. The current administration and dormitory building was built in 1934. One of the more prominent pupils, and later teachers, at the school, was Luther Haden "Dummy" Taylor. Taylor was born in Oskaloosa in 1875. While most accounts say that he was born deaf, his family did not list him as such on the 1880 U.S. Census. He was listed, in the 1885 Kansas Census, as being a pupil at the Kansas School for the Deaf in Olathe. He remained at the school through his high school years pitching for the baseball team and boxing. After leaving the school, Taylor played for semi-pro and minor league baseball teams in Missouri, Illinois and Indiana. As of 1900, he was playing for team in Albany, New York. He was called to play with the New York Giants in 1900 and in 1902, went to play for the Cleveland Broncos (later to be the Cleveland Indians) for more money but he was persuading to return to the Giants the next season. In 1903, new manager John McGraw turned the Giants into a formidable team being National League champions in 1904 and 1905. Taylor was sold to the Buffalo Bisons in 1909. Taylor would remain in the minor leagues until his retirement from baseball in 1915. 1903 image of Taylor on the New York Giants. Via Library of Congress. Taylor would return to the Kansas School for the Deaf in 1915 where he would become the physical director and baseball coach. Taylor then moved to the Iowa School for the Deaf in and then the Illinois School for the Deaf. He continued to be very involved with baseball. In August 1958, Luther Taylor passed away at Our Savior's Hospital in Jacksonville, Illinois. He is interred with his first wife, Della, in Prairie City Cemetery in Baldwin City. 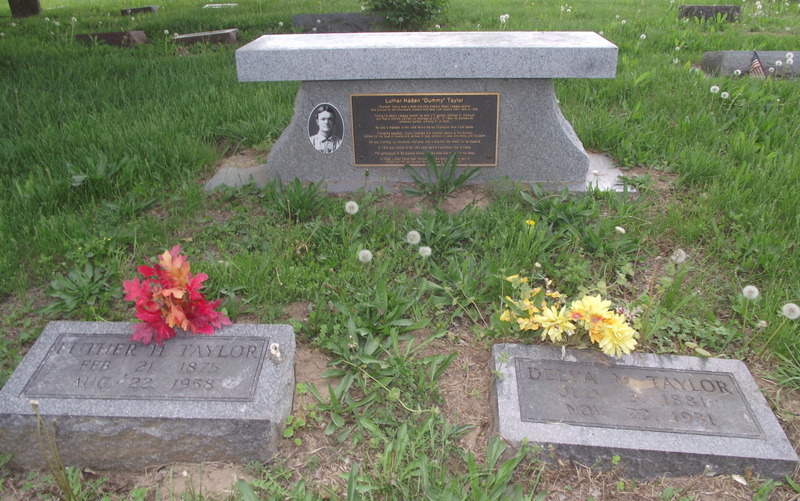 Gravestones for Luther and Della Taylor in Prairie City Cemetery. Photo by author. The Kansas School for the Deaf continues a tradition started by Philip Emery back in 1861 of educating children despite the absence of hearing. Students are encouraged to live up to their full potential and are judged by contributions and character. For more information, please visit ksdeaf.org or the Kansas Deaf Cultural Center located on the Olathe campus. 1227: There Are Other Tea Cozy Companies?! 1222: What's In the Cup? Chocolate Milk? 1218: A Four-Panel Daily Strip?! 1206: They're Still In School? !